Expecting a child this year or know someone who is? Here’s why a DVLA personalised number plate is a good investment. Whether you have thought about private number plates as an investment opportunity or not, more and more parents are choosing to invest in a private number plate, instead of opening ISA’s or personal savings accounts for their children. When some parents were asked of their reasons why they felt the need to invest in a special registration numbers, they saw it as a good long-term investment and felt they would get more of a return for it than any interest added to a bank account. Whether we know about the investment opportunities connected with owning private number plates or not, most of us simply want a registration plate because it’s a fun way of accessorising your car. You can pick a named plate or choose a private plate which holds a special number, or you could choose a cheap dateless number plate which will disguise the age of the car. David Charlie – “No brainer really. Private number plates look after you, just choose wisely and seek help from the experts if you’re unsure where to begin”. Heather Logan from Cleveland bought GO12 DON for her husband as a birthday gift. 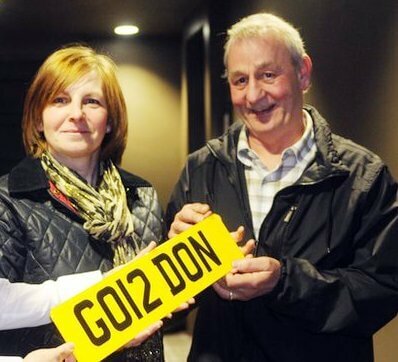 They already own seven other registrations including 33 HL and 33 GL but Mrs Logan couldn’t miss the opportunity to buy her husband’s name on a plate. “If there’s something you want in life, and you can afford it, then why not go out and buy it. We think of them as investments.” said Mrs Logan. Britishcarregistrations.co.uk has an easy-to-use search facility online where you can search for personalised number plates quickly. All you need to do is enter your special details – initials, dates, name and all the options will come straight up. It’s not only individuals buying private and personalised car regs, there has been an increase in businesses purchasing plates to help drive the advertising and marketing for their companies. In some cases, they buy multiple plates for their whole fleet of cars. Overall, British Car Registrations do advise people to consider registration plates as an investment. You could put spare money into a savings account, but with interest rates so unpredictable, it is highly unlikely you will get a return on the money. Any investment requires a tough decision – just think about gold and property investments. These used to be very lucrative products to invest into in the past, however now prices tend to fluctuate considerably. Private and personalised number plates are a very safe bet, which is why many people are investing in them these days. The market for private car regs is always solid – they retain their value and some also increase in value. Top Tip: when looking to invest, common names will always be sought after plates. Buying and enjoying a named plate means that if an actor, sports player or another public personality comes into the limelight, imagine how much you will be able to save the plate for? For example, can you imagine the value connected with ‘Mr H Potter’ if he had bought a plate before the Harry Potter phenomenon hit the world. If you already own a private plate and you want to know its value, British Car Registrations offers a free-no obligation valuation selling service.